The largest encyclopedia of the world, tens of thousands of books, free streaming music and video without tariffing traffic. We connect more services constantly. Chat and share with friends as you like. The most popular social networks and messengers are included. Wikipedia in all languages and free books in SmartKyivstar app. Read whatever you like. Watch your favorite movies, TV series and channels from included apps – without subscription fee and data charges. Millions of music tracks for all tastes and moods in your smartphone. Unlimited streaming. Try it now - it's easy. What are the 3G benefits? use super-fast mobile internet without being tied to a Wi-Fi, computer or laptop. stream music and video. To find out more about streaming go here. send and receive email, share photos and files just in few seconds. play online games with minimal ping-delay. With the speed at which data is transmitted in the 3G-network? How much does 3G internet cost? How to know is there 3G in my city? All new towns in which we are launching 3G-coverage immediately appear on the map here. How does work dual-SIM smartphone in 3G? Generally, in dual-SIM devices only one of the two slots support 3G. Standard mark should be near the SIM-card slot. If this information is not there, browse specifications in the instructions for your device. What affects the speed of 3G internet? Technical capability of device. In user’s manual should be indicated the bandwidth for certain phone as well the maximum speed of mobile internet. 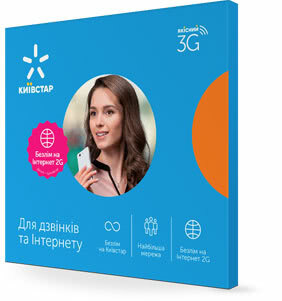 3G standard of device – WCDMA (up to 2 Mbps), HSDPA (14.4 Mbps), HSPA+ (up to 42,2 Mbps). Subscribers activity on network (its capacity). The time and place when accessing the internet. For example, when you go by car the 3G speed on your smartphone will be lower than if you walk. Will my battery drain real fast with 3G? That’s right, when you stream music or videos or use the internet in 3G-network, your smartphone is discharging faster. If the phone will operate as an access point ("distribute" the data to other devices), it dies less than in hour of intensive use. Most manufacturers specify in the characteristics of a mobile device, how long the phone will live in 3G-network without recharging. We recommend you also check your apps. Some of them can perform in the background, constantly consuming data and battery life. When there is no need for 3G-speed internet, you can choose 2G network settings and thus extend the life of your smartphone by 10-30%. to activate power saving phone mode (the availability of this function depends on model).